NEW YORK, April 17, 2019 (GLOBE NEWSWIRE) -- High performance and Nissan Intelligent Mobility take center stage at the Nissan exhibit at the 2019 New York International Auto Show – including a celebration of the 50th anniversaries of the iconic Nissan GT-R and 370Z sports cars. Also making its auto show debut is the all-new, third-generation 2020 Nissan Versa, which is scheduled to go on sale in summer 2019. /EIN News/ -- The 2020 Nissan GT-R 50th Anniversary Edition, Nissan GT-R NISMO and 370Z 50th Anniversary Edition all are making their world debuts in New York City this week. Other showcase vehicles on display from April 19th through 28th at Jacob Javits Center are the 2019 Altima All-Wheel Drive, LEAF NISMO RC 2.0 and Nissan Formula E race cars. “If you love performance vehicles, both modern state-of-the-art production cars and historic sports cars, this is a one-of-a-kind opportunity to see many iconic Nissan and Datsun vehicles in one place,” said José Valls, president and chairman, Nissan North America, Inc. In addition, there is also a collection of historic Datsun and Nissan performance vehicles in a special “Dream Garage.” A special media panel focusing on the Dream Garage vehicles, given by current Nissan GT-R Chief Product Specialist Hiroshi Tamura and legendary Datsun/Nissan racer/constructor Peter Brock of Brock Racing Enterprises (BRE), will take place at 1:25 p.m. today. The 2020 Nissan Versa is designed to take the popular nameplate to a new level with a clear expression of the Nissan brand. The stylish entry-level 4-door Versa is set to go on sale in summer 2019. The third of four popular Nissan cars to be redesigned in the past seven months, the all-new third-generation Versa remains unmistakably Nissan – from its high-value, class-above design and convenience features to its advanced Nissan Intelligent Mobility safety technology. The new Versa is longer, lower and wider than the previous version, while maintaining Versa’s roomy, versatile interior. Nissan’s advanced Safety Shield 360 technology suite will be standard on Versa SV and SR grades. 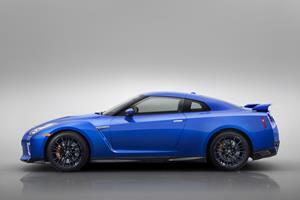 The 2020 Nissan GT-R 50th Anniversary Edition pays homage to Nissan’s performance heritage and includes a unique exterior and interior treatments, including special seat embroidery and an Alcantara® headliner with unique stitching. Based on the 2020 GT-R Premium model, it also offers increased performance. Three exterior color options are offered, each with special 50th anniversary strips, badging and wheels. The interior features unique coloring and badging. It goes on sale at certified Nissan GT-R dealers in summer 2019. The 2020 Nissan 370Z 50th Anniversary Edition commemorates the original 1970 Datsun 240Z with special exterior and interior appearance enhancements. Based on the 370Z Coupe Sport grade, it is available in a choice of two exterior two-tone color options – white/red or silver/black. Each combination includes special BRE-style accent stripes, side market decals and 50th Anniversary rear badging and red wheel accent stripes. Inside, the leather and synthetic suede sport seats are highlighted with 50th Anniversary seatback embossing and red accents. It is available with manual or automatic transmissions and goes on sale this month. “The New York International Auto Show is always one of Nissan’s favorite global auto shows because of its knowledgeable, enthusiastic crowds. We’re pleased to be bringing such a wide range of significant production and race cars here for the people of New York to enjoy,” said Valls. To find out more about the 2020 Versa, GT-R NISMO, GT-R 50th Anniversary Edition, 370Z 50th Anniversary Edition and the entire Nissan lineup, please visit NissanNews.com.